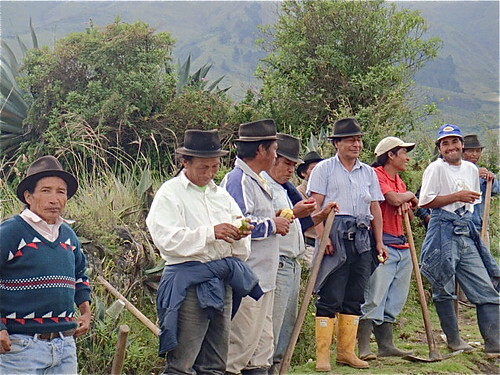 Cotacachi organic farming offers business opportunity. 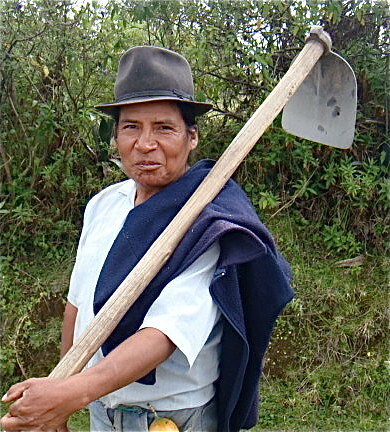 See how you can help wonderful Cotacachi farmers like this and earn an excellent income. I could not agree more and though I was lucky to be holding a lot of cash and short term bonds during the 2008 market correction, I am busy investing this into real estate and my own business now. This week I am writing a special series on ways to earn income in Ecuador… or anywhere you choose. Personally I have purchased seven condos on Ecuador’s beach as well as a Cotacachi office building. 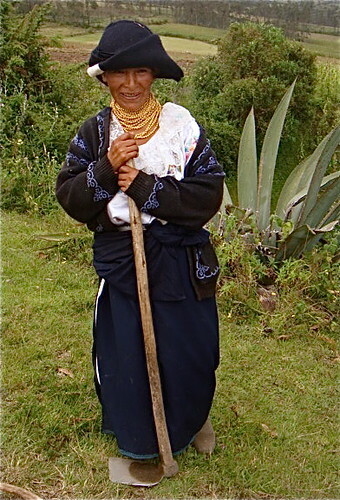 We are expanding our Cotacachi business as opportunity presents itself. Right now we are developing a Panchakarma clinic in Cotacachi. Yet I see more opportunity than I can possibly have time to develop. 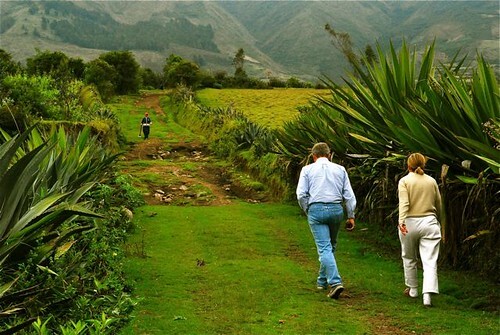 One such opportunity is in Cotacachi organic farming. We recently wrote about Topo, a village near Cotacachi where our foundation is helping upgrade a school. We are also helping the village improve their water supply. Topo, in the indigenous way, has an entire area above their village where they do not allow building. This is the village farm. When we visited the school last week, we also walked up and visited the mingo (working party) who was working there on improving the water supply. Here is a picture taken by our friend Dennis Goff as Merri and I headed up the mountain. These farmers lead a dignified, simple and beautiful life and there is a way we can make their way of life better by helping them farm better and organically. There will be more about these farmers in an upcoming message. Here may I introduce a great business opportunity that can create profit and help this village or farmers in almost any poor country around the world. For years I have been writing about an organic soap – degreaser that I became enamored with than a decade ago when after trimming one of our outside Christmas trees my hands were covered with pitch. The manufacturer had given me a bottle of his cleaner and it was amazing how it cut through the pitch. This changed the way we clean everything because this cleaner is organic, bio degradable, non toxic, and cleans really well. We use this on everything because though it is totally organic and readily biodegradable, it is a potent germ killer. I wash my hair with it yet I have a copy of a lab report from Davis Analytical Laboratories in Sarasota Florida which shows that two to three drops has the same effect as one drop of clorox. Then it was discovered that this cleaner and some derivative formulas make excellent bio washes, fertilizers and even pesticides (though they cannot be sold as such in some countries). I introduced this product to the arborist we have been using to fight the Wooley Adelgid blight in the Hemlocks of North Carolina. He has told me that he has used this (as we do) to effectively stop the blight. These solutions are certified free of all carcinogens, including the ones described in this article. One of he world’s largest retailers did an intensive study of all “green” and “environmental” cleaning products and discovered that these cleaners are the only truly green ones. Here is where the opportunity comes in. 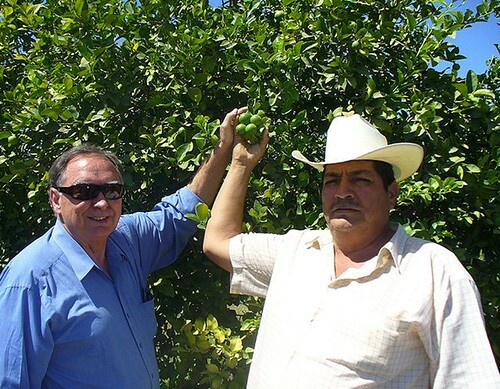 The product can help organic farmers in many countries. Mexico is one good example. 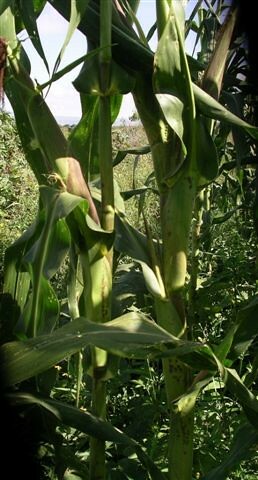 Corn is the biggest crop in Mexico The average Mexican corn farmer earns about $100 per acre. 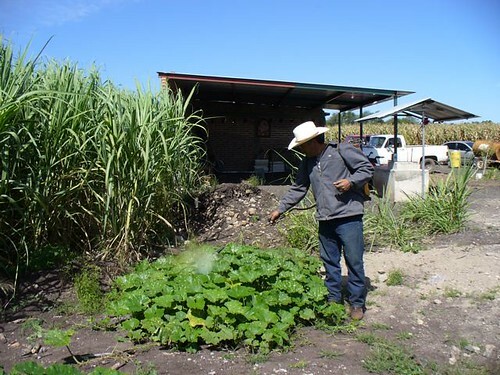 Dr. Rico’s five acres brought him approximate $2,000 or $400 per acre. In Nuevo Italia, and other farmer treated approximately 1,000 mango trees. He advised that his increased averaged 300 additional mangos per tree and earned an extra $60,000 income. His quality had increase so significantly that he received six pesos per kilo instead of the normal four pesos per kilo. His yield has increased dramatically. Instead of the usual 2 to four limes per cluster, some clusters had over ten limes. The photo above shows Antonio and our friend holding a cluster of eleven limes. In Antonio’s area, the papayas season normally runs from January to May or June. In November, 2008, Antonio’s friend, Pedro visited our plant. 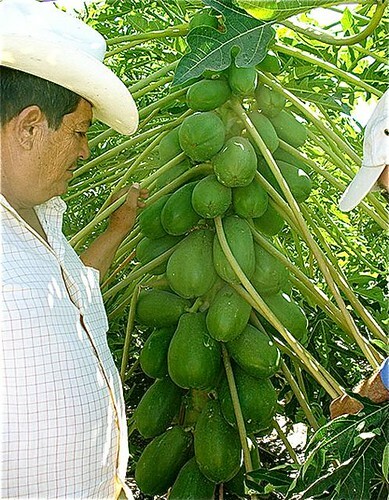 Pedro advised that Antonio was still harvesting and selling papayas in November. He ships them to Los Angeles labeled “Pesticide Free.” Antonio’s income from 25 BioWashed acres is estimated around $1,000,000. 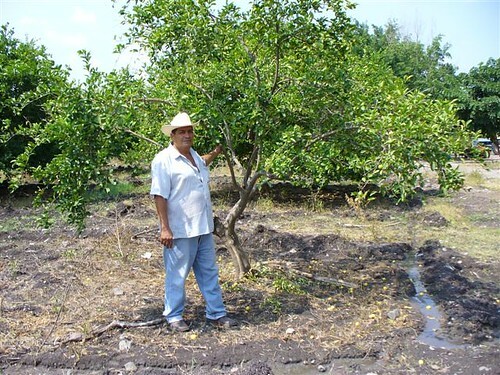 Antonio hired 20 additional men to help harvest his produce, thus reducing the need for those men to the U.S. for employment. 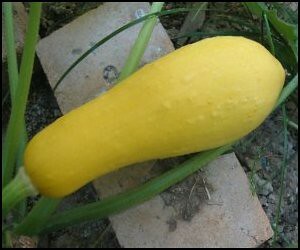 Farmers who BioWash perennials such squash and tomatoes extend their productive season. Dr Rico’s brother grows backyard tomatoes. His vines continued producing tomatoes for 12 weeks rather than the usual six weeks. 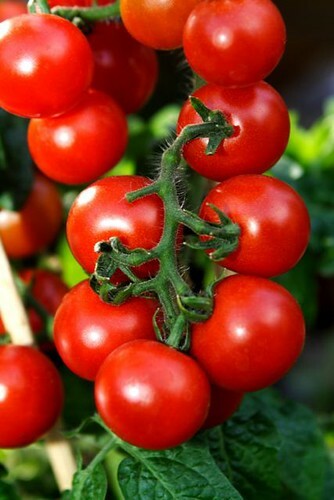 He discovered that BioWashed tomatoes remain edible up to six weeks after harvesting. Until next message may all your income be good. Here is a business opportunity offer with six days to go.